The cry, “My God, my God why have you forsaken me?” (Mark 15:34), is an authentic expression of Jesus’s emotions and heart. It gives witness to the depth of his human experience. It is an honest exclamation and an authentic question. However, it does not accuse; it laments. This arises from the intimacy Jesus shares with the Father as the Son is willing to express his heart fully while dying upon the cross. Some hear the cry as a kind of relational abandonment where the Father “turns his back” on Jesus because Jesus had become sin at this moment or because he bore the weight of sin in this moment. This is important, for example, in some popular articulations of penal substitutionary atonement. Some hear the cry as an expression of some sort of tear or pathos within the Triune God where God experiences alienation within God’s own life as the Son experiences a “Godforsakenness” and the communion between the Father and Son is, in some real sense, broken. This is important for some because in this way the Triune God (Father, Son, and Spirit) suffers as God as well as the incarnate Son, and through this the Triune God becomes fully empathetic with humanity in its suffering. On the one hand, I affirm the reality of divine suffering through the cross. The Father mourns the death of the Son. Further, through the experience of the Son who shares fellowship and intimacy with the Father, the Father also suffers with the Son through the Son’s suffering. Also the Spirit, who rests upon the Son, groans with the Father and the Son in this moment. The pathos of suffering is not alien to God, that is, God is not incapable of suffering. Through the Son, God suffers, and God suffers as Father, Son, and Spirit. The cross is the mourning of God. On the other hand, the unity and relational fabric of the Trinity is not ripped apart in this moment. Their communion does not waver. The Son trusts the Father, and, as Luke clarifies, the Son commits himself to the Father (Luke 23:46, quoting Psalm 31:6). The Father does not abandon Jesus in death, and neither does the Son lose faith in the Father. The Triune communion remains in tact. Rather than relational abandonment, the cross is the moment where the Son is embraced by the Father’s love through the resting of the Spirit upon him. 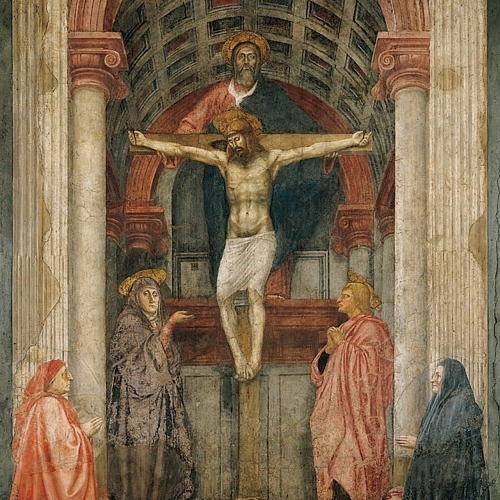 This is wonderfully depicted by Masaccio’s fresco (1425-1426) in the Santa Maria Novella in Florence, Italy. The fresco is high on the wall, and the work is viewed from a low point rather than directly. Consequently, we raise our eyes to view it, and as we lift our eyes we first see Jesus hanging on the cross, then we see the Spirit (as a dove), and then finally the Father who stands facing the cross within the sacred space of the chapel. We see, then, the Holy Trinity gathered—one on the cross, one resting on the head of crucified one, and one towering over the scene. The three occupy the same space, engaged in the same moment in time, and fully invested in the event itself. The Father stands behind the cross with his arms stretched out practically embracing the Son as he hangs on the cross. Far from turning his back on the Son, the Father loves the Son, encircles—as it were—the Son, and thus assures the Son of the Father’s love. The Father is not distant but occupies the same space as the Son. Indeed, the Father supports the Son with his arms as if he is holding him up. There is no abandonment or rejection here. The Spirit is represented as a dove, which rests upon the Son. Just as the dove descended on the Son at his baptism and anointed him with power, and just as the Spirit led the Son into the wilderness and throughout his ministry, so now in death the Spirit is still with the Son. There is no abandonment or rejection here. The Father, indeed, abandoned the Son to death, but the Father did not abandon him on the cross. The Father abandoned the Son to death, but the Father did not abandon him in death. The Father abandoned the Son, just like the Father does us, to the grave, but he did not abandon the Son in the grave. By the power of the Spirit, who rests upon the Son, the Father raised the Son from the dead, just as the Father by the power of the Spirit will raise us from the dead in the likeness of his Son. Glory to the Father, and to the Son, and to the Holy Spirit, as it was in the beginning, is now, and will be forever. Amen. Allelujah. This entry was posted on February 4, 2017 at 4:04 pm	and is filed under Uncategorized. Tagged: Cross, Death, Masaccio, Psalm 22, Resurrection, Suffering, Trinity. You can follow any responses to this entry through the RSS 2.0 feed. You can leave a response, or trackback from your own site.